Pinyon Trees, edge of road. Distance: 20 feet, close to road, views with naked eye were good, very close. Singing Male, Zee Zee Zee zoo zee Flycatching on edge of Pinyon tree stand near road. Also observed Yellow-rumped Warblers nearby. I saw this bird and noticed first that it had an all black throat with yellow cheeks with another duller pattern around eye. 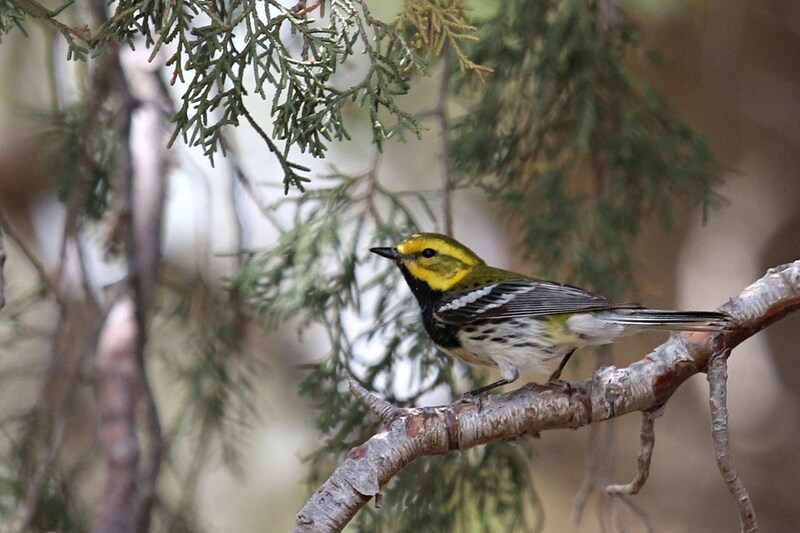 I initially thought it might be a Towsend's Warbler, another observer, Steven Larson got a better look and called out Black-throated Green Warbler, upon better looks I saw the green head down to mantle and bright white wing bars. Also the spot of yellow on sides of vent area. Kathy Mihm-Dunning called out seeing the yellow wash on upper belly. Numerous pictures were taken by Glenn Walbek, Joey Kellner, Steve Larson, etc. I made the report at 1:14pm in my notebook. I notice streaking on breast. Joe Roller comment that the streaking might of been weak, making it a possible 1st year Male. After reviewing the photos taken, I believe it to be an adult male. Towsend's Warbler, was elimated after seeing the green head and back, with yellow cheek, head and dull eye patch of green color. Green color all the way down from head to back. Yellow on vent with white undertail coverts. White wing bars with yellow wash on upper belly. The high level observers in the field helped ID the bird on site. I referenced National Geographic Sixth Edition for confirmation of all field marks. 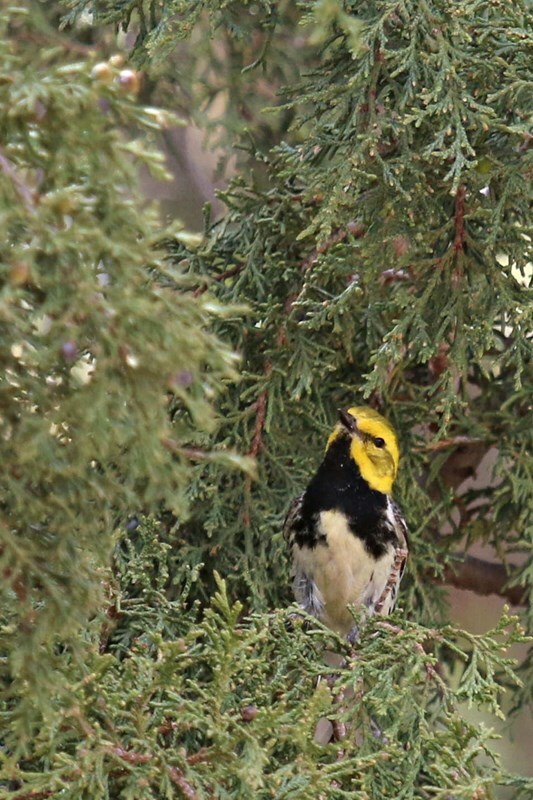 I had recently seen a Townsend's Warbler in Pueblo and had been observing many, many Yellow-rumped Warbles, both Audubon's and Myrtle and realized right away it was not that, but looked more like a Townsend's, it had and all black throat, eliminating Yellow-rumped.